Lately, while watching the sunset with Kizzie, I've been seeing a man and a little boy walking through the neighborhood. My guess is they are father and son. The little boy might be around four years old. And he's very curious. They move slowly because he needs to inspect the bark on a tree. Or pick up an acorn. Or look at a plant. Or run his finger through the crack in the sidewalk. Or follow a passing squirrel to see where he's going. By my count, he stops an average of four times for each property. It's a long block, so it must take at least an hour to walk around. And while that's all sweet and everything, what really catches my interest is the father. Because he is SO patient. And not only that, but he points stuff out for his son to stop and inspect. It's really nice to see a father spending that kind of quality time with his son, especially in a region where most people are workaholics and hire aupairs to deal with their progeny. The dad's patience got me thinking. I could never be that dad. My god. If you're going for a walk, then go for a walk! This kid stops way more than my dogs do to sniff and whatnot, and sometimes I'm too impatient even for their sniffing. To me, the goal of a walk is for you to get to the end efficiently. It wasn't always that way. When I was in better shape, the goal might have been sustained aerobic activity. Enjoyment. Or to see scenery on a hike. But now, I guess, it's just to get it done. Which makes me a little sad, but that's for a different blog post. This post is about patience. And goals. And it's also a little about "thank god Tierney never had children because she is definitely not suited for the reality of being a parent." There are times I can muster patience. But I don't really need to practice it very often. Most goals in my life are met before patience comes into play. Or maybe that means I'm sufficiently patient enough to enable my goals. 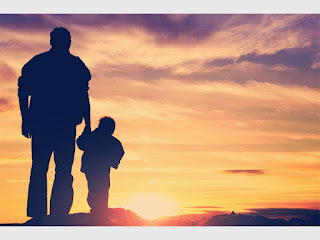 Looking at that man and his boy, however, I saw there were levels of patience way beyond what would be realistic for me. And don't get me wrong. I'm not knocking that. I admire his patience. I'm just saying I clearly am lacking because it would drive me batty. I could do one walk like that maybe, but they're out there a couple of times a week! Still, I can see what a special time it is for both of them. My dad had no patience for his children, which is probably where I get my lack of patience for them from. And as a result, I grew up feeling like I wasn't worthy of that effort. That little boy will never forget how his dad took time for him, tried to see the world through his eyes, and was truly interested in whatever interested him. It's a very healthy and wonderful thing, assuming he's not similarly indulged at home. Then it could turn the kid into a monster. But from my front stoop, as I sit there with one around my boy, singing to him and whispering sweet nothings even though he's a dog, it's a beautiful thing to see. This has also got me thinking about where I might be chasing the wrong goals. For me, on a walk with a child, my goal would be to get to the end. But look at all I'd be missing. Like my time on the stoop with Kizzie, this is probably the best time of that dad's day. (And, in my defense, plenty of people don't have the patience to watch a sunset, so I do have some patience in me.) It's like how my dieting goals are screwed up...my goal is to sufficiently deprive, rather than strategically nourish, for example. Or with exercise...the goal is clearly to torment myself with inaction, instead of strengthening my asthma addled lungs or some other more compelling reason. Up until recently the goal with my book writing was to power through, as if it is a chore. Instead, now I'm more inspired to serve the needs of people who want to form a one-on-one connection with spirit. It's a more fulfilling goal. So it's a question worth considering, especially in places you're stuck or unable to move forward. Maybe instead of beating yourself up for not meeting a goal, maybe you're pursuing the wrong goal in the first place. That man's goal is not to take a walk with his son. It's to make special moments with his son so he doesn't miss out on anything. Both goals get you to the same finishing line, but one is more motivating and fulfilling. How might you apply this to your life?